The Talking Box: HIMYM: The Countdown is On! HIMYM: The Countdown is On! 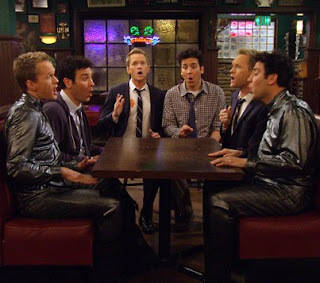 How I Met Your Mother "The Time Travelers" (S08E20): At MacLaren's, Barney and Ted have tickets to Robots Vs. Wrestlers Legends - elderly wrestlers and old-time robots - but Ted doesn't want to go. Barney brings 20-years-from-now Ted and Barney to convince Ted, but then 20-hours-from-now Ted shows up to spoil the fun. [haha!] Present Ted (but really still years-ago Ted) then thinks he should go but not drink too much... but future-Barney thinks the drinking has to happen for the memories. [I like the idea that you should ask yourself "what would make the best memory 20 years from now?"] 20-minutes-from-now Barney arrives, and soon enough, a coat-check girl from seven years earlier shows up. [the time travel is pretty fancy, I gotta admit!] Ted goes over to talk to her, but future coat-check girls come to tell him that it's going to end in misery, 20 months down the road, so he lets the present girl leave the bar.